In recent years the case for disarmament has not only gained spotlight with the state of the Korean peninsula but also gained justification as the renewal of Britain’s nuclear ‘deterrent’ is set to cost the treasury a figure close to £205 billion pounds. With a pro-trident PM in power there is currently no realistic possibility of the government reversing renewal, which should be surprising considering the inconsistency trident has displayed in testing, so the only prospect of nuclear disarmament at the moment is how the Labour Leader Jeremy Corbyn positions the labour party should there be another election. Trident has also been shrouded by myths in recent years and become an effigy for the alt-right of this country that represents the reinvigorated ideology of Great Britain and the former empire leading people to prioritise the idea of trident being a statement of national pride rather than a rational deterrence tool; this is dangerous in the modern world especially considering Britain’s diminishing role on the world stage. The geo-political climate at the moment is at its most turbulent and precarious it has been especially regarding the current president of the United States and the naive dictator of North Korea locking horns in a – to put it bluntly – childish way. If there was an advert for not having nuclear weapons it most certainly would be Trump’s America! Trump epitomises how America is consumed in its own self-importance, escalating conflict for the last 80 years showing no signs of demilitarisation today – with the Trump administration announcing the production of more lethal weapons of mass destruction as a so called deterrent to Russian aggression. Even Putin can’t justify committing genocide against 100,000s of people on the eastern front like Trump claims he will. Not only does this stir things up again in Eastern Europe but it also sends dangerous signals to North Korea at a time when relations are most unstable, even a nuclear deterrent can’t protect a country if a provocateur is of unhealthy mind; if they have the insanity to murder countless civilians – it is hard to imagine they have the compassion to care about their own citizens facing the same fate. So in a time when things are most tense with international relations, it wouldn’t be mad to suggest our best bet is to just stay out of it! In Britain, Trident is faced by widespread opposition with irrational support. Our current Prime Minister; Theresa May, has expressed consistent support for our nuclear weapons programme infamously claiming she would kill 100,000s of men, women and children if the opportunity for nuclear retaliation ever came. Following on from the vote in the commons that, expressed a substantial majority in favour of renewing Trident, opposition to Trident has not and will not be quelled. 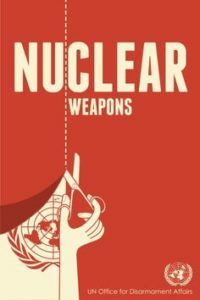 The fact that the UN voted two thirds in favour of banning nuclear weapons is paramount in endorsing opposition to nuclear weapons renewal in England as it is now recognised as being illegal under the new treaty. Regrettably, Britain decided to abstain from the talks and the vote and instead remarked their commitment to the Nuclear Non-Proliferation Treaty (NPT), an outdated treaty that Britain and other countries that have committed to still struggle to abide by! All this overlooks the staggering cost that Trident will amass, stating an initial figure of £40 billion but having the potential to rise to over £200 billion. One of the most overlooked arguments against Trident is how the government can justify this when there is a current deficit and funding crisis in our public services especially the NHS that is fundamental to ensuring we live in a fair and tolerant society saving far more lives than a nuclear deterrent ever would. Now to conclude, it is understandable why there is distrust towards foreign nations when it comes to nuclear weapons and that unilateral disarmament would be a big risk to take when not done multilaterally; but when looked at rationally, Trident is deterring little more than an unjustified ‘threat’ from Russia or the instability of the Kim Jong regime that would surely end should he ever press the red button. Therefore it leads me to believe that support for Trident labels it as an effigy for consolidating the revived sense of patriotism we have seen in this country since the rise (and fall) of UKIP and the definitive Brexit vote. It is perceived as a statement to Britain’s former pride that when looked at in closer detail is driven by those of toxic ulterior motives that seek to divide out communities and create an incongruent, unequal society establishing a firm opinion of mine that renewal of our nuclear weapons should be avoided at all costs. 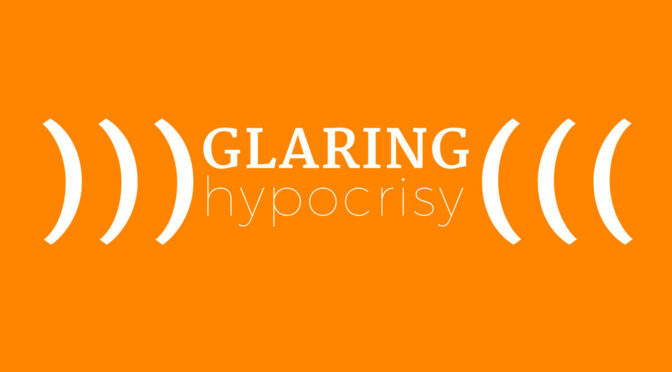 When I read the news as I do every day, undoubtedly an article will appear, usually in the politics section where the word ‘hypocrisy’ will pop into my mind. Recently, this has been the news regarding the vote between the United Nations to start negotiations on a treaty to ban nuclear weapons. On the 26th of October 2016, 177 countries came together at the UN General Assembly to vote on this very issue. A ban on the use of all categories of nuclear weapons. 38 countries voted against the proposal, including the UK and US. Whereas 123 countries voted in favour, including maybe surprisingly, North Korea. North Korea is a country mentioned in the media frequently concerning the use of nuclear weapons. Only in June of this year, were the Guardian and other news outlets reporting that “Kim Jong-un has boasted of North Korea’s ‘sure capability’ to strike US targets on the Pacific”. Yet, a country perceived as such warmongers in the media, voted for the proposed ban. Why did the US and UK vote against the ban? Well that’s a complicated question that I suspect many people differ on opinion. Security? I doubt it. Nuclear weapons are systematically useless. Mhairi Black MP, put it brilliantly when addressing commons, she said: “We have already established the fact that we would not fire this weapon first, we would not launch this weapon. So the only time we are saying that we will ever use this weapon is if somebody has a nuclear strike against us, and to be quite frank that means we’re all dead anyway. And if I’m dying, I don’t care if we’re sending one back or not, I’m more worried about the one that’s coming towards me”. They do not defend us against the real threats of today, those being terrorism, epidemics and climate change. It’s hugely disappointing when your own government won’t support a ban on nuclear weapons, yet one of the supposed enemies of the west is voting in favour of it. However, I don’t hold North Korea to be in anyway innocent and their proposed ban could be for more sinister purposes, but of course this is just speculation. It appears to be unequivocally unjust that there are the funds for Trident, which will cost the government in excess of £205 billion, yet there isn’t enough money to properly fund our public services, our welfare system and our higher education system. This can be seen by the growing waiting lists for operations in hospitals, more people than ever using foodbanks at over one million uses per year, and larger than ever class sizes with most children not getting their first choice of school. Hospital operation waiting lists in the UK are at a record high of 3.9 million (as of Sept. 2016) and this year has been the worst for referral-to-treatment waiting lists in more than 5 years. These figures show that our NHS is underfunded and understaffed. I have many close family members and friends who work in the NHS and they have a first-hand experience of the service on a daily basis. They tell me that in some job roles, if someone leaves or retires, in many instances those roles don’t get filled again. Other members of that team are then expected to take the outstanding workload between them on top of their already highly demanding workload. More people than ever are using food banks, and between April 2015-16, the Trussell Trust say that over one million three- day emergency food supplies were given to people In crisis. The latest Trussell Trust figures show a 2% increase in foodbank use on the previous year, with the most popular reason for needing to use a food bank were ‘delays to benefits’. The primary reason people used foodbanks last year was because of a faulty system. A system that could be amended or changed, yet nothing is done. And finally, class sizes. 100,000 pupils in the UK now face being in an oversized class (over 30 pupils per teacher), with increases expected. In fact only 6 years ago, in 2010 there were 31,000 students in oversized classes, now there are 69,000 extra, more than a double in 6 years. It is also worth adding that this year alone, 1 in 6 children did not get their first choice of high school, and in London only 63% got their first choice. With a growing population, an increasing demand on school places and not enough investment in schools, a disaster is beginning to unfold. Clearly, the current approach to these services is not sustainable. As CND themselves have said, instead of spending even £100 million on nuclear weapons, “we could employ 150,000 new nurses, build 1.5 million affordable homes or pay the tuition fees for 4 million students. 2 million jobs could be created, rather than 7,000 currently sustained”. I began this piece with the word ‘hypocrisy’. Hypocrisy is when you care to spend £205 billion on an arguably redundant set of nuclear weapons, and then say that there is no money for more important things. Glaring hypocrisy has been the underlying theme of this piece, because for me, our government’s stance on Trident compared to its stance on the NHS, social care, education, welfare, housing, poverty and other important issues, absolutely screams of hypocrisy. To me, our government are hypocrites. So, let’s rally our government, let’s email and write to our MPs and let’s campaign to make a difference. Because, without our members and activists, change couldn’t happen!! The clash of unarmed protesters and heavily militarised police is unfortunately all too familiar in 2016. From Black Lives Matter to tuition fee demos, the response to popular protest now regularly involves some level of violence, even when activists are employing entirely peaceful methods. Protests at Standing Rock in Dakota, opposing the construction of an oil pipeline, have been the most recent example of this. But after months of action, last week brought good news for those at Standing Rock. Their fight against the construction of a section of the Dakota Access Pipeline, which will transport oil produced through fracking across America, was vindicated as the US Army Corps of Engineers announced they would not give permission for that section to be built. Activists had camped out close to the reservation of the native American Sioux tribe since April, demanding that the US government refuse contractors a permit to build through the area; they argued it would not only threaten the supply of clean water, but would destroy sites sacred to the Sioux tribe. 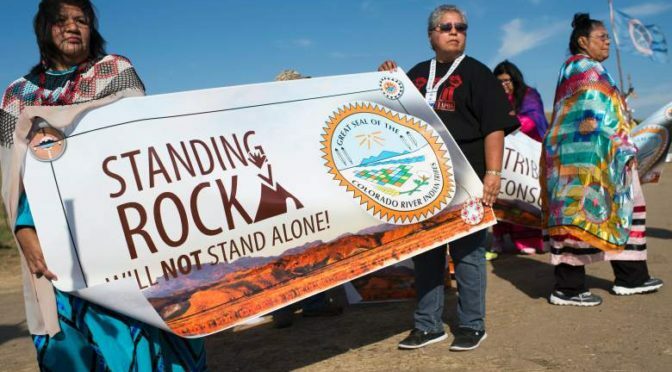 It was a campaign that brought together native Americans and environmental activists, fighting to protect the planet and the rights of indigenous people. It was also a protest that was proudly and defiantly pacifist. Guns and other weapons were banned from the protesters’ encampment from the outset, and even faced with police violence protesters did not respond in kind. Yet the reaction to this clearly peaceful protest was ruthless violence, from local police forces and private security forces. In fact, the pipeline protests only came to mainstream attention after Democracy Now reported on the use of police dogs against the protesters, resulting in bites and other injuries. Since then, Standing Rock has faced tear gas, rubber bullets, sound and water cannons, tasers, and a plethora of other devices described as ‘less-than-lethal’ munitions. The tear gas grenades used have been banned in many other US states, whilst the water cannons’ effect has been amplified by the below freezing temperatures at Standing Rock, leaving protesters coated in ice and unable to recover properly in their basic camp. One protester is reportedly facing possible blindness in one eye after being hit by these weapons, whilst another nearly lost her arm. When questioned local police claimed they were using violent measures appropriately – for example not aiming water cannons directly at protesters – even when video footage clearly showed otherwise. The situation at Standing Rock became so hostile that a group of US veterans moved in and formed a protective barrier between protesting civilians and police and security forces. State violence of this kind is always abhorrent, but against patently unarmed civilians it becomes ridiculous. 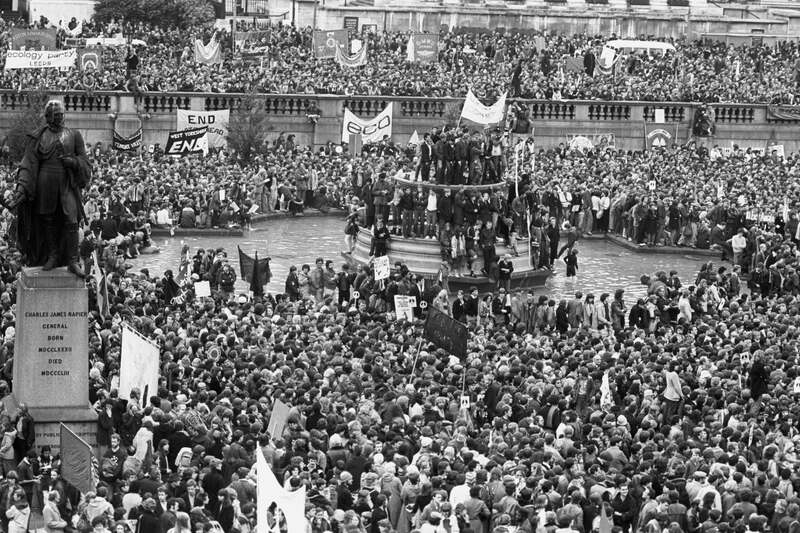 People engaging in legal protest and civil disobedience were met by enforcement agencies as though they were an armed brigade, as though this was a war rather than a demonstration. In fact, the equipment being used by police were instruments of war; following the decrease of America’s military presence in the Middle East, heavy duty equipment used in these conflicts has been sold off to police forces across the country. This is why we see images from America of police responding to events dressed for war, riding in armoured tanks and grasping automatic weapons. Thus the violence of the Dakota Pipeline protests can be directly linked to the violence of recent wars. But at Standing Rock, protesters held out against this uneven power struggle and have halted the construction of the offending section of the pipeline. Peaceful yet determined activism has won. In fact, the injustice of the heavy militarisation of the police response has been key in gaining mainstream media attention, as well as the sympathy and support of large swathes of the public across the world. Standing Rock has highlighted the almost commonplace nature of police violence, as well as proving it doesn’t work. A group of environmental activists and native Americans, armed with nothing but their convictions, have faced the might of a militarised police force – and convincingly shown their peaceful methods are the ones which work. 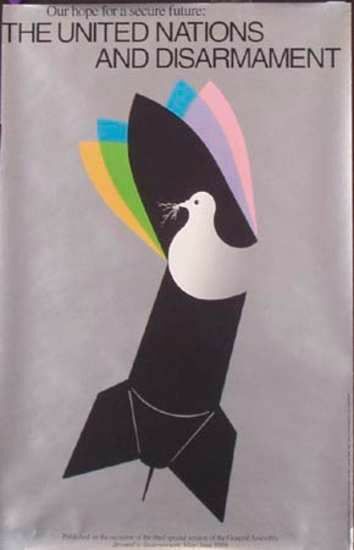 week was called for in the Final Document of the General Assembly 1978 special session on Disarmament. Why the 24th October? This date was particularly chosen because it marks the anniversary of the inception of the United Nations. 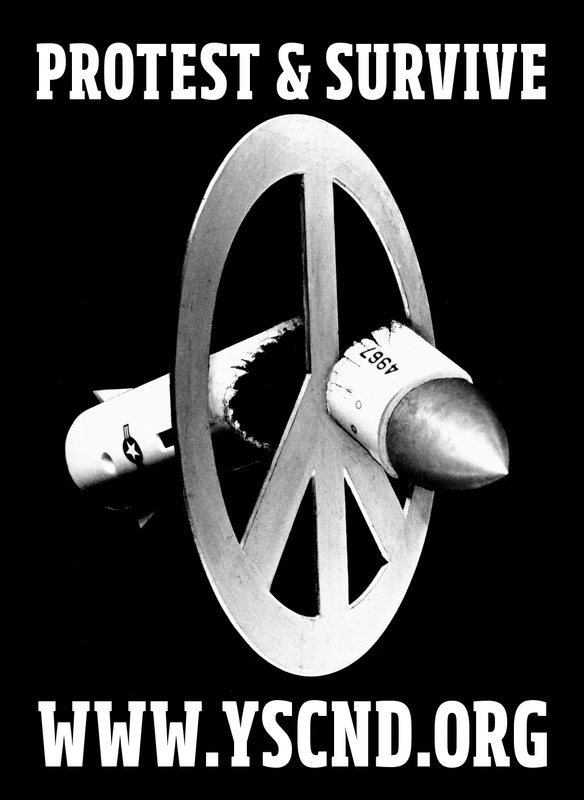 It offers a chance for reflection on the world and its relationship with nuclear weapons. As the UN celebrates its 71st birthday, it has been widely recognised as a positive force, and that despite all of the criticism that the UN may have faced, there is still an ever-growing need to fight for positive progression in creating a more stable and peaceful world – particularly with regards to nuclear issues. Although our generation is lucky to have not lived through a world war like the generations before us, it is important that we do not forget the importance of global security and a way to successfully implement it by learning significant lessons from the past. The connection between the cessation of a global war and the creation of an inter-governmental organisation is extremely prevalent, especially today. While the potential threats have changed dramatically since the start of the UN (chiefly because the technology since then has become so advanced), the overall aim of international peace has not wavered. No one wants a repeat of the World Wars or the Cold War. In spite of several countries refusing to get rid of their nuclear weapons, and others decidedly blocking legislation that would encourage global disarmament (ahem Australia! ), there have been several important steps over the previous year’s towards ultimately achieving global nuclear disarmament. The Non-Proliferation Treaty (NPT). Anti-Ballistic Missile Treaty. The International Atomic Energy Agency. Comprehensive Test Ban Treaty. SALT talks which turned into the New START talks between Russia and the U.S. Comprehensive Test-Ban Treaty (CTBT). Partial Nuclear Test Ban Treaty (PTBT). United Nations Office of Disarmament Affairs (UNODA). This list is just scraping the top of the barrel when it comes to the vast amount of grass-roots movements, organisations and agencies that all work towards a shared goal of nuclear disarmament. There are also region agreements against nuclear weapons and the implementation of Nuclear Weapon Free Zones, which current encompasses 39% of the global population. So just over a third of the planet live in completely nuclear free areas! Even with several failings of the UN to stop the proliferation of nuclear weapons in its totality, the world has seen several (aforementioned) outstanding contributions towards global disarmament of nuclear weapons – which are all little stepping stones towards the final goal. at we have flouted our agreement of non-proliferation and to begin disarming ourselves. Over 45 years after signing this international agreement, we are continuing to ignore our prior commitments. Even though the NPT talks were held in the United States, the US have not done particularly well with regards to meeting its obligations to the NPT. However, this was thought to have changed one fateful day in 2009 in Prague. Regardless of your personal thoughts on Barack Obama, he has set a new precedent for American Presidents of the future in his speech in Prague in 2009, by stating that the current US Administration is the idea of “global zero”. Global zero is the idea nuclear weapons and capability for every country will be non-existent in the foreseeable future. The idea that we should not accept any governments renewing their military and civilian nuclear stores at a ridiculous expense (£205 billion for the UK, and $1 trillion in the USA) whilst they remain signatories of international treaties that oblige them to begin disarming. And we should not allow for the possibility that nuclear weapons have the potential to fall into the wrong or untrustworthy sources, which could potentially mean that the world is not safe from nuclear threat. Was Obama’s Prague 2009 speech filled with hollow rhetoric? Potentially. Does it seem wholly utopian and unattainable? Not really. Its cliché to for it to be a comparison, but I’m going to push the boat out and say it anyway. Martin Luther King Jr. had a dream which he shared with a group of protesters at the “March On Washington for Jobs and Freedom” in 1963, which reverberated throughout the world and is one of the most well-known speeches ever given. At the time of the speech, it didn’t feel like in his life time there would be quality. Lo and behold, with the passion and fervour of thousands of people working towards this shared infamous dream, it is now a reality. If we continue to work towards the shared goal of a nuclear weapon free world, and we keep pushing a little bit further towards our goal, we may one day too achieve our dream. Despite Obama not pursuing his great passion for his vision of a great nuclear free world, it is still of significance that he said it. Being the leader of the free world with such clear aims can only reverberate positivity across the four corners of the earth. Obama has broken a nuclear taboo which many presidents before him have failed to address so publicly and with such disdain. This year within Nuclear Disarmament Week, on Thursday 27th October 2016, there was an important document signed which 123 countries have voted to support negotiations for a global nuclear ban at the United Nations General Assembly today. Resolution L41 was adopted by the First Committee and means ban treaty negotiations will be convened in 2017. Just 38 countries voted against the resolution and 16 abstained. Again, this is another incredibly important step. One that must neither be under or overestimated. As a period of reflection, the UN Disarmament Week is good for shining the light on what the world is doing for Nuclear Disarmament as a whole. It highlights the sheer amount of people who are in agreement that nuclear disarmament is still in the fore of peoples minds and illustrates the sheer determination to people whom have dedicated their lives to achieving change. Not only is this important for the morale of the grass-roots campaigners who can visibly see that change is happening from the top down (no matter how slowly!) – but it is also a clear message to countries across the world that humanity will not tolerate, or quietly accept, a severe increase in nuclear weaponry. 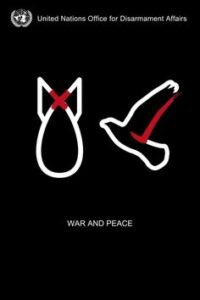 *Guest Blog Post* A world without nuclear weapons?